Martin Luther was one of the most important figures in the Protestant Reformation of the 16th century. His famous 95 theses, (possibly) posted on the gates of All Saints’ Church in Wittenberg almost 500 years ago, were “trending” all over Europe within a few weeks of their original publication. In fact, he was a master of the communications technology of his day, quite possibly inventing the pamphlet as a means of communicating beyond scholarly circles, and using his prolific writing and the public support it generated to enormous effect. Small wonder then, that undergraduates studying his work today value the opportunity to see and touch the printed material that fuelled the Reformation. The Taylor Institution Library is fortunate to have a large collection of Luther pamphlets and other publications. These were acquired in the 1870s on the recommendation of Friedrich Max Müller, the second Professor of Modern Languages at Oxford. Many of them came from Heidelberg University, which at the time was disposing of duplicates. Because of this history, we are able to offer them as teaching copies, and, with supervision, undergraduates are allowed to turn the pages, feel the paper, and as a result, gain a sense of how contemporary audiences encountered Luther’s writings. Two groups of undergraduates recently had this experience at the Taylorian, guided by their academic supervisors, who have kindly allowed me to use my notes as the basis of this blog. The first group, from the History Faculty, had already studied the texts on display in translation. They noted the differences in the quality of the paper and print between volumes, the elaborateness of some title pages compared with the sparseness of others. Unbound short pamphlets were not widespread until Luther made the form his own. Printers flocked to Wittenberg, which soon became a centre of printing, in large part due to the flow of content from Luther. Some specialised in printing his hymns, others in Bibles, while still others printed his pamphlets. Another area of interest for this group was the network of buyers, sellers and producers of pirated copies which meant that Luther’s ideas spread so quickly across Europe. The average number of copies of a pamphlet printed at that time was about 1000. 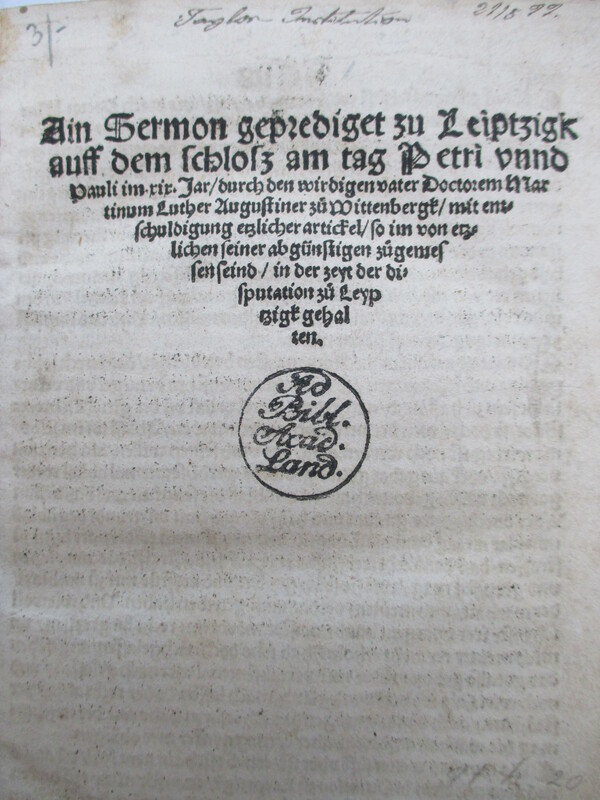 An initial print run of one of Luther’s pamphlets would be about 4000, and would be sold out in days. This was a money spinner to rival that of the printing of indulgences, which had been a steady income until Luther challenged the practice. However, as the selling of the pamphlets was illegal, it was often printers’ wives who were the undercover sales people. The second group, students of German from the Modern Languages Faculty, looked at the same texts, but with a different focus. First of all they studied the title pages. Some of them were fairly plain, but others had allegorical meaning relating to the text inside, and their meaning would have been “read” by contemporaries along with the text. Allegorical title page showing the vine (Christ) providing a protective shelter over the idyllic society beneath, where lions and bears are living alongside rabbits, deer and lambs. Luther’s text calls on Christian nobility to take responsibility for building a Christian society. 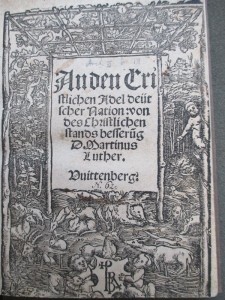 One of the texts, Widder die hymelischen propheten: von den Bildern vnd Sacrament  was written by Luther in response to the destruction of images in churches, which had been orchestrated by a former follower, Karlstadt. In it, Luther highlights the importance of images as an educational tool for those who are unable to read, and also points at the illustrations in his own publications, which were used by those bent on destroying images. Luther considered that hypocrisy. Luther himself valued images greatly, and used them in many publications. He was close friends with Cranach, a court artist, and this association with secular authority gave the publications prestige. The group also considered the sheer quantity of Protestant writings. Luther wrote by far the most of all the reformers, but he was not alone in writing, and Catholics who resisted the reformation were unable to compete. They were partly hampered by writing in Latin, which was not accessible to such a wide audience. There was also a danger that in responding to a particular challenge from the reformers, they would have to give at least an outline of the reformers’ ideas, which could give them further publicity. 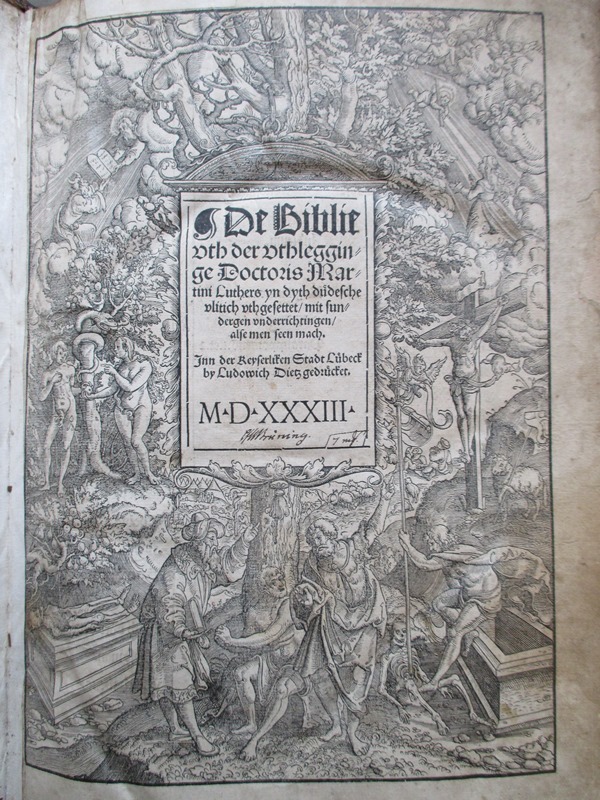 Finally, the undergraduates looked at a Luther Bible. They studied the title page, to see whether it gave any clues as to the nature of the Bible. They noted the handwriting on the facing page, which gives a list of births, showing that the Bible was being used as a family bible in the 17th Century. They noted that the book was printed in Lübeck. 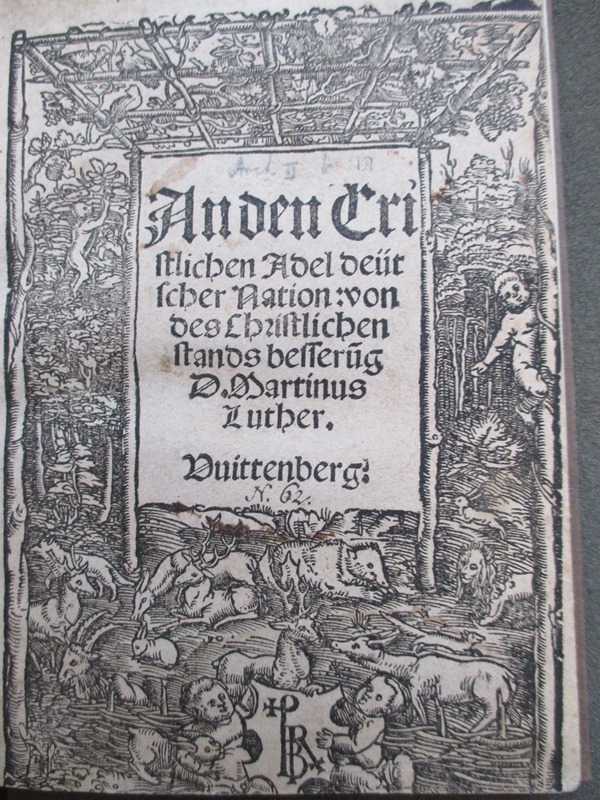 This is in fact Luther’s Bible printed in Low German, and it predates Luther’s Saxon German Bible by a few months. It was prepared by Bugenhagen, sometimes called the second apostle of the North, who helped Luther with the translations for the Saxon German version, and then translated the whole thing to Low German, beating Luther to publication by a couple of months. This Bible is particularly important because its place of publication is a Hansa town, with all the trading and travel links that implies. This Bible travelled around the Baltic, and was influential in many translations into neighbouring languages. All the undergraduates were extremely enthusiastic about this opportunity to encounter the texts as they would have been seen by contemporary audiences, and felt it had added a new dimension to their studies. 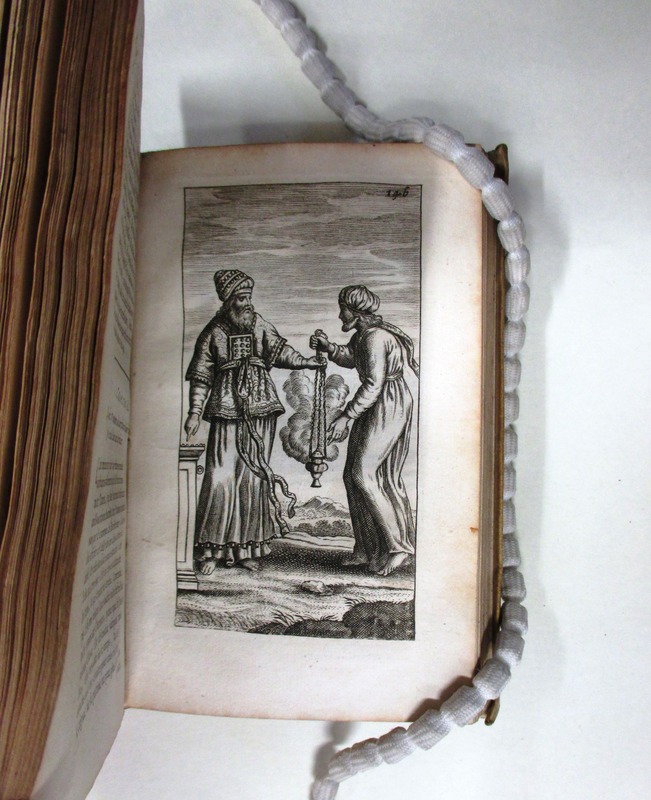 Several students discovered new things about the library – they were unaware that we had rare books, or that it was possible for undergraduates to request to see them. The seminar leaders were enthusiastic about being able to use the library’s collections to engage their students, and are actively looking for other opportunities to run similar sessions in the future. 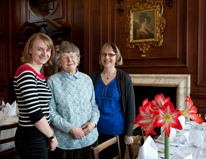 As a librarian, I was delighted to see such enjoyment and enthusiasm being generated by our collections. It is a privilege to be able to offer that experience, and a reminder that we are far more than a museum of treasures. It was also a privilege to be able to be present at these seminars, and I would like to thank Dr Madeleine Brook of the Modern Languages Faculty, and DPhil Candidate Edmund Wareham of the History Faculty for making them possible, and for allowing them to become the subject of this blog. Chrisman, Miriam Usher. Lay culture, learned culture : books and social change in Strasbourg, 1480-1599. New Haven : Yale University Press, c1982. McKim, Donald K., ed. The Cambridge companion to Martin Luther . Cambridge: Cambridge University Press, 2003. Pettegree, Andrew. Reformation and the culture of persuasion . Cambridge: Cambridge University Press, 2005. Pettegree, Andrew. The book in the Renaissance . New Haven, Conn. ; London : Yale University Press, c2010. 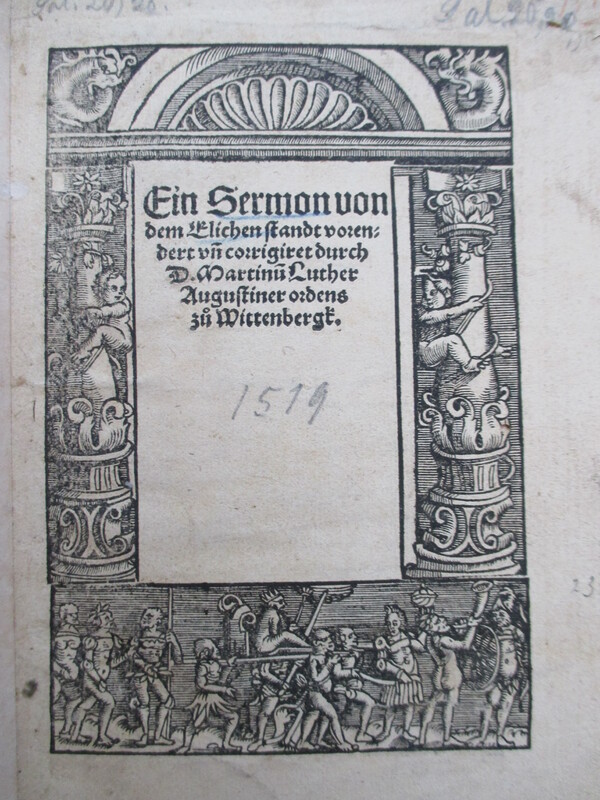 Scribner, Robert W. For the sake of simple folk : popular propaganda for the German Reformation. Oxford: Clarendon Press ; New York : Oxford University Press, 1994. 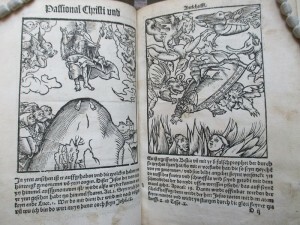 This entry was posted in Special Collections and tagged Lucas Cranach, Martin Luther, Protestant Reformation on 30 March 2015 by Clare Hills-Nova. The Polish film Ida, directed by Pawel Pawlikowski, was the winner of the Best Foreign Language Film Oscar at the 87th Academy Awards last month. Originally released in Poland in the latter part of 2013, the Academy Award was the latest instance of widespread recognition for the film at award ceremonies and film festivals during the previous year, including Best Film at both the Polish Film Awards and the European Film Awards, as well as Best Film Not in the English Language at the BAFTAs in early February. Described by one critic as ‘a spare, haunting piece of minimalism’,[i] this strikingly shot black and white film follows the story of a young novice nun in 1960s Poland who is sent to explore her family’s past before taking her vows. When it was issued on DVD in late 2014, the Taylor Institution Library acquired the film for its collection of European and world cinema, and Ida became one of the most recent additions to the Library’s holdings in Polish film. The Taylor’s collection of Polish cinema comprises nearly 150 feature films, plus several collections of shorts, with films ranging in date from the early 1930s – by such filmmakers as Juliusz Gardan, Józef Lejtes, and Henryk Szaro – up to the present, with works from the 2000s, including, for example, films from the ongoing careers of the directors Jerzy Skolimowski, Jerzy Hoffman, and Agnieszka Holland. With multiple works by approximately fifty Polish directors included in the Taylor Library, the collection provides a thorough introduction to the country’s national cinema. Andrzej Munk’s Heroism / Eroica – described as ‘a bitter satire on Polish heroism’[v] – is a two-part film, the first part about a soldier in the Home Army during the Warsaw Uprising, and the second set in a prisoner-of-war camp; while Ashes and Diamonds / Popiół i diament – the final work in Andrzej Wajda’s war trilogy (following on from A Generation / Pokolenie (1955) & Canal / Kanał (1957)) – is based on Jerzy Andrzejewski’s 1948 novel, and explores the conflict between Home Army and communist factions in a small Polish town as the war ends. As well as including these two milestone films, the Taylor Library’s film collection covers the breadth of the careers of these two important directors. Wajda’s work is represented through the 1970s and 1980s right up to his most recent film, Walesa. Man of Hope / Wałęsa. Człowiek z nadziei, a bio-pic of the former Polish president, released in 2013, while holdings of Munk’s work are near-comprehensive, from documentary shorts of the early 1950s up to his final film Passenger / Pasazerka (1963). 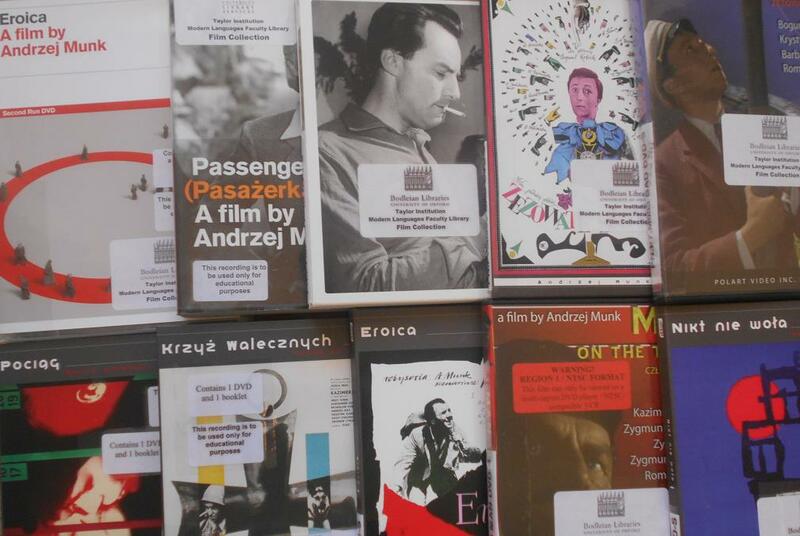 But the Taylor Library collection also moves well beyond this period to encompass Polish cinema up to the present day. The ‘Third Polish Cinema’ period of the later 1960s is represented in the collection by films such Krysztof Zanussi’s first full-length feature The Structure of Crystal / Struktura kyyształu (1969), an ‘almost philosophical story’[vii] which explores the contrasting approaches to life of two physicists, one actively ambitious and the other content with a more low-key but peaceful lifestyle, and Skolimowski’s Hands Up / Reçe do Góry (1967, 1985), banned until the 1980s because of its depiction of Stalinism (prompting Skolimowski to leave the country); while the Library’s examples from the late 1970s and early 1980s – the period of Poland’s ‘Cinema of Moral Concern’, also described as the ‘Cinema of Distrust’[viii] – include Agnieszka Holland’s early films, such as Provincial Actors / Aktorzy prowincjonalni (1979), and A Woman Alone / Kobieta samotna (1988), about the fate of a single mother living in difficult circumstances, and described as ‘one of the darkest and most brutally honest films ever made’. [ix] Library holdings naturally also include the much-acclaimed and influential works of Krzysztof Kieślowski – there are examples in the collection of his early works such as The Scar / Blizna (1976) and Camera Buff / Amator (1979), about a man who becomes increasingly immersed in making films, with significant consequences – as well as his major works of the late 1980s and 1990s (Dekalog (1989-1990), the Trois Coleurs trilogy (1993-1994)). The Taylor collection is then brought up to contemporary times with recent releases by both well-established directors and those who have emerged since 2000, such as Andrzej Jakimowski and Małgorzata Szumowska (who recently won the Silver Bear for Best Director at the 2015 Berlin Film Festival). Pawlikowski does not make direct comparisons between Ida and previous Polish filmmaking, but he has described the film as having ‘the confidence Polish cinema once had to go its own way’;[x] the various ways taken by generations of Polish filmmakers may be explored via the Taylor’s film collection. 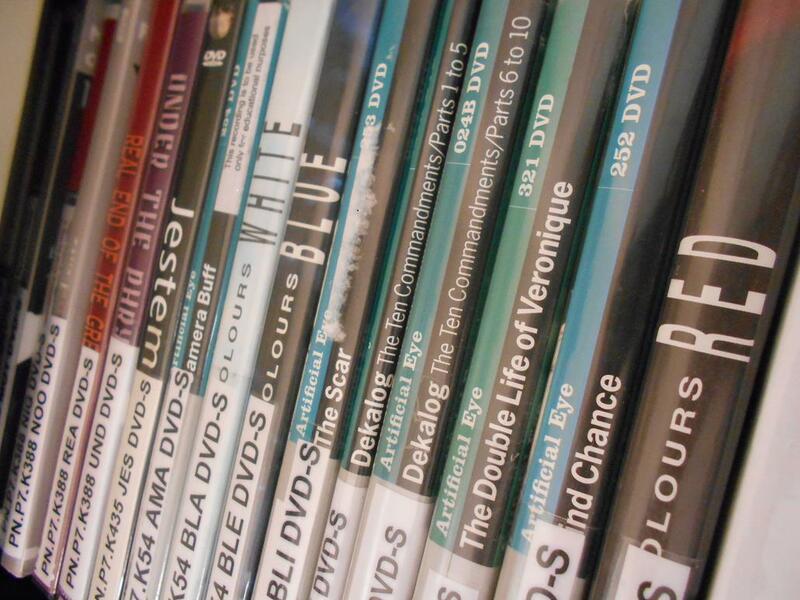 The Taylor Institution Library film collection can be used by members of the university; films may be used for the purposes of teaching, study and research only. 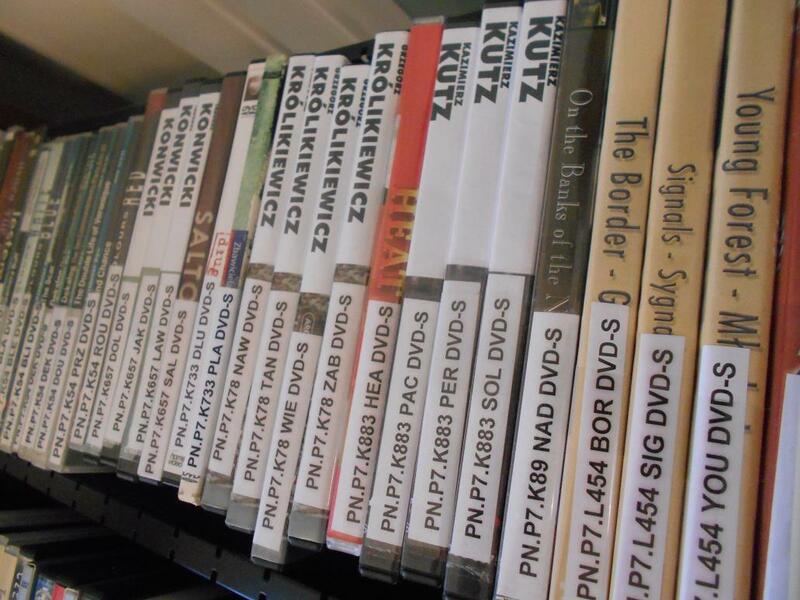 All of the Library’s films are catalogued on SOLO; to browse Polish films, search in SOLO for PN.P7*, limiting your search to ‘in the shelfmark’. [i] Catherine Wheatley, review in Sight & Sound, vol. 4 issue 10, October 2014, p. 72. [ii] Interview in Cineaste XXXIX:3 (Summer 2014), pp. 40-44. [iii] Marek Haltof, Historical Dictionary of Polish Cinema (Lanham, Maryland: Scarecrow Press, 2007), p. 148. [iv] Marek Haltof, Polish National Cinema (Oxford : Berghahn Books, 2002), p. 80. [v] Haltof, Historical Dictionary, p. 48. [vi] Violet Lucca, ‘Interview: Pavel Pawlikowski’, Film Comment, 29 April 2014 http:filmcomment.com/entry/interview-pawel-pawlikowski. [vii] Charles Ford and Robert Hammond, Polish Film: a twentieth century history (Jefferson, NC: MacFarland, 2005), p. 154. [viii] Haltof, Historical Dictionary, p. 29. [ix] Haltof, Polish National Cinema, p. 158. [x] Violet Lucca, ‘Interview: Pavel Pawlikowski’. This entry was posted in Film Studies and tagged BAFTAs 2015, Oscars 2015, Pawel Pawlikowski, polish cinema, polish film on 16 March 2015 by Dan Q.
February 28th was the the birthday of the French writer Michel de Montaigne (1533-1592) and so now is a good time to consider a collection of books which The Taylor Institution Library received not so long ago – the Sayce bequest. 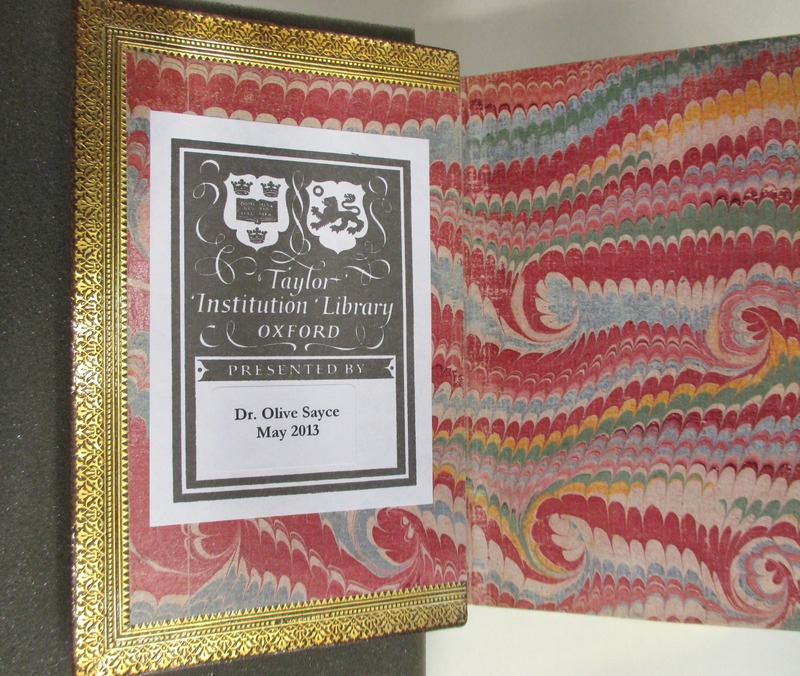 Back in the summer of 2013 the Taylor Institution Library received a collection of 285 rare books (mainly French but some in other languages) from the personal collection of the scholar and Oxford don, Dr Richard Sayce, after the death of his wife, Olive Sayce, in March 2013. Richard Sayce (1917-1977) taught at Oxford since 1947. He became a Fellow of Worcester College in 1950 and Fellow Librarian of Worcester College in 1958. He would hold these posts right up to his death at the relatively young age of 60. He is mostly remembered as a Montaigne scholar and this academic focus is reflected in this collection of books. He compiled a comprehensive bibliography of early editions of Montaigne, completed after his death by David Maskell: A descriptive bibliography of Montaigne’s Essais, 1580-1700 (Oxford, 1983). His wife, Olive Sayce, another Oxford scholar but who specialised in German medieval poetry, wrote a touching memorial of her husband’s life. R.A. Sayce, 1917-1977: a memoir (Oxford, 1983) recounts his early life on the Welsh Borders (the name Sayce derives from ‘Sassanach’), his travels during the Second World War (in the course of which he found India ‘too hot’ but found Persia more congenial even to the extent of learning Persian), how they met – in the Senior Staff Room of the Taylor Institution (‘not one of the most romantic places!’). There are about 285 books in Richard Sayce’s antiquarian collection. Fourteen of them were published in the 16th century, 128 in the 17th century, 123 in the 18th century and the rest in the 19th and 20th centuries. Like many of the scholars’ collections which have come to the Taylor Institution Library it is very much an intentional collection. Each book purchase was a deliberate act and the collection as a whole not only reflects the personality and interests of the man who collected it but also the man at the centre of the collection – Michel de Montaigne. Richard Sayce was a man who loved and valued books. Olive Sayce records that he made one of his last book purchases shortly before his death. 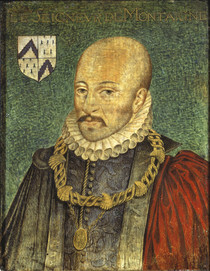 At the centre of the collection are works by and relating to Montaigne. 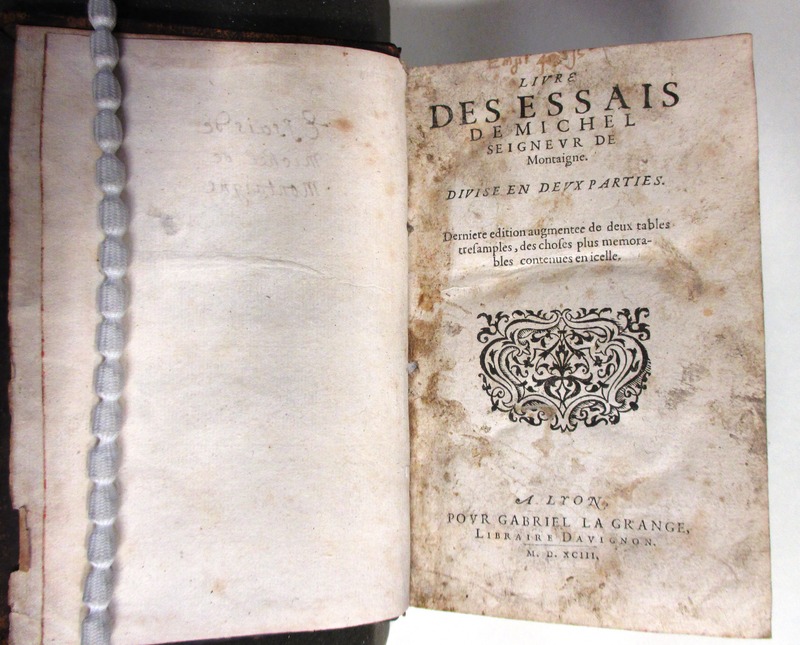 There is an early edition of Montaigne’s Essais published in Lyons in 1593 (SAYCE.8). 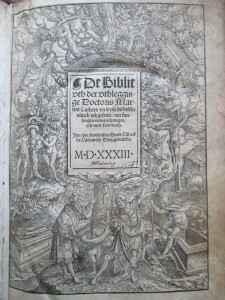 This was the next edition to be published after the edition of 1588 – one of the copies of which was personally annotated by Montaigne himself and is known as the ‘Bordeaux edition’. 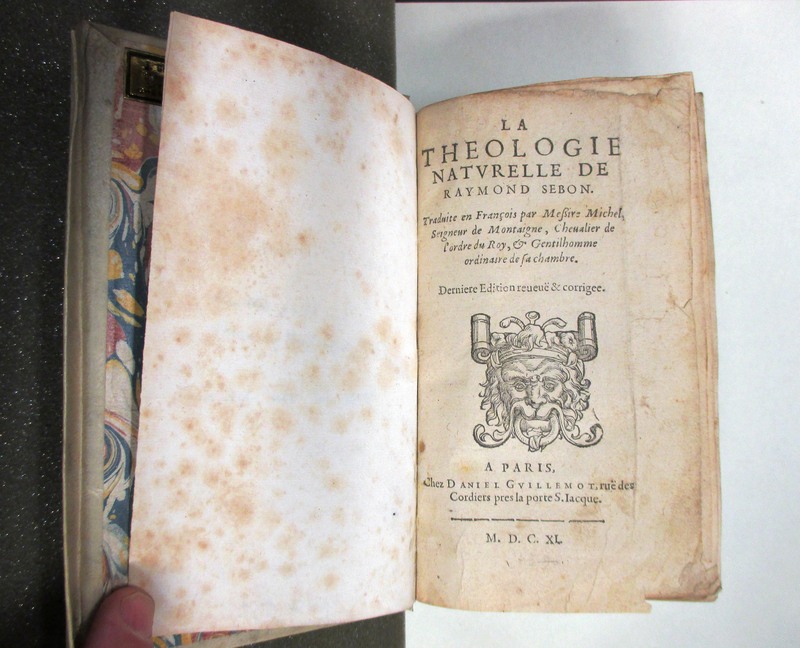 The Taylorian already had the second volume of this 1593 edition in our Special Collections (containing Book III of the Essais) so it is good that we now have a complete set. After that edition the Sayce Collection contains editions published in 1600, 1602, 1604, 1608, 1617, 1619, 1640, 1649, 1652, 1669, 1677, 1695, 1724, 1725, 1754 and 1776 – many of them recorded among other editions in A descriptive bibliography of Montaigne’s Essais, 1580-1700. Richard Sayce’s own copies are recorded in the card-indexes in the archive in Worcester College with his initials RAS. It is interesting that the 1695 edition of the Essais in the Sayce collection does not appear to be recorded in the bibliography. It is also perhaps unfortunate that the bibliography ends with the year 1700 as there are a number of 18th century editions of Montaigne that also deserve to be recorded in a bibliography. Scope for a sequel, perhaps? Montaigne’s Essais are his personal reflections on different aspects of human life. They are based on his own experience and thinking. They are down-to-earth and full of common-sense, making use of many quotations and a vigorous and vivid style. Whatever the subject they always come back to one man’s personal experience – that of Montaigne himself. Montaigne discusses himself with an objectivity and honesty which is surprising and revealing and also the very method of the Essais. The Essais contain many allusions and quotations from the classics, some of them from books contained in the Sayce collection such as Plutarch, Seneca, Cicero, Tacitus etc. Latin authors are quoted in the original Latin. Some of these works are to be found in the Sayce Collection in early editions. The ideas contained within the quotations are then refracted through Montaigne’s own mind and experience to reveal much that is new and original. As we read the Essais we have a remarkable sense of getting to know Montaigne as a person – as a wise friend. Montaigne himself had a library of some 1000 books and this would have been considered a large collection at the time. Only about 101 books survive. Pierre Villey, in his Les sources et l’évolution des essais de Montaigne, listed 271 books which are known to have belonged to Montaigne. How many of those 271 books are represented in the Sayce Collection? Certain of the major works are there (although not the actual copies and probably not the actual editions which Montaigne owned). The Sayce collection boasts early editions of Plutarch’s Vie des hommes illustres t.1-2 (1565) (SAYCE.9-10) and Les morales de Plutarque (1575 and 1594) (SAYCE 11-12) both of which were in Montaigne’s library, according to Villey. 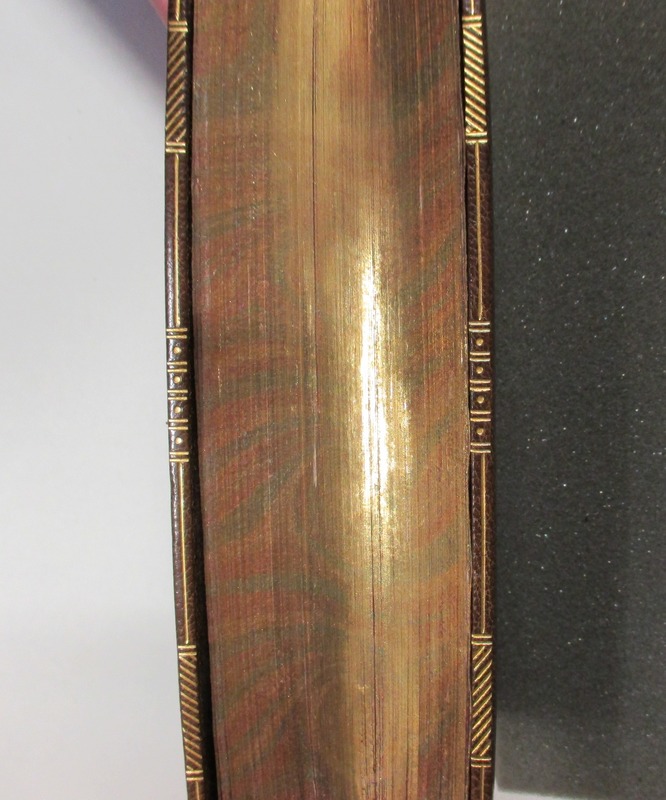 Montaigne mentions having Plutarch in the French in one of his essays and this would have been the Amyot translation which we also have in the Sayce Collection. 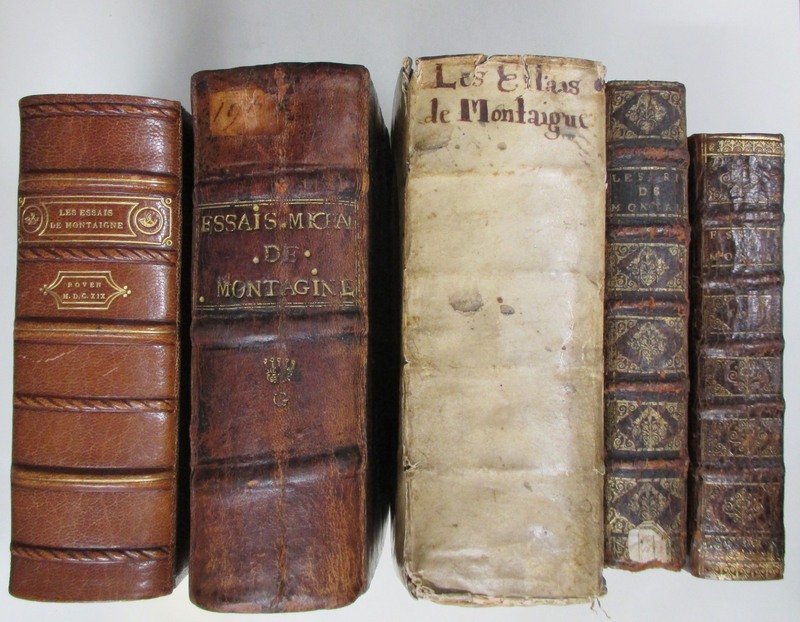 Some of these could have been the actual editions which Montaigne owned but we do not know this. 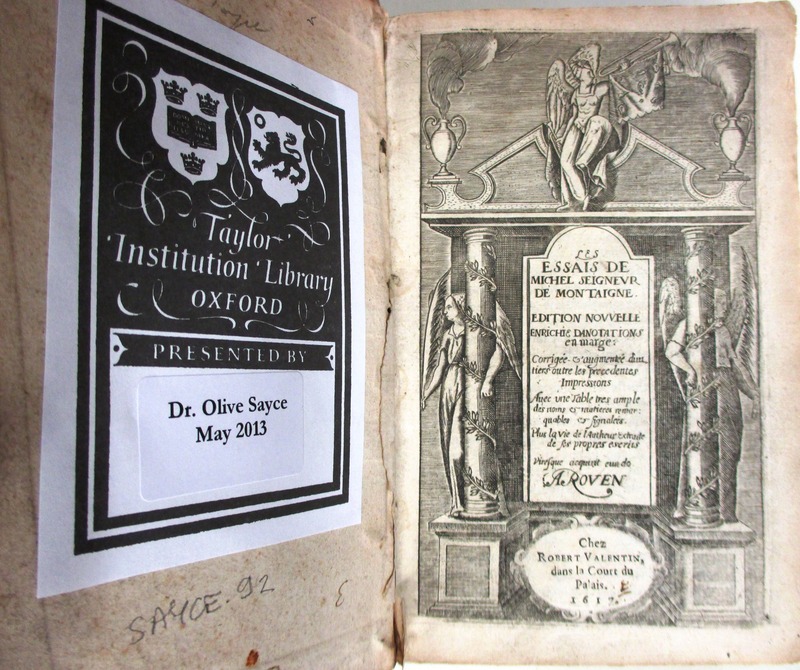 Montaigne owned a copy of Gellis’s Circe and an early edition of this can be found in the Sayce Collection (1600) (SAYCE.61). 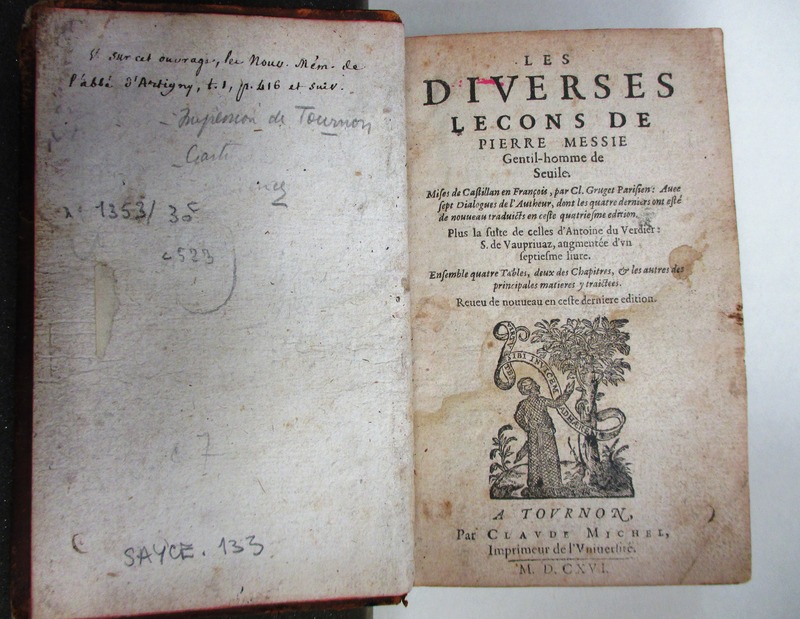 Les diverses leçons de Pierre Mexia, owned by Montaigne, is also present in the Sayce Collection (1616) (SAYCE.87). 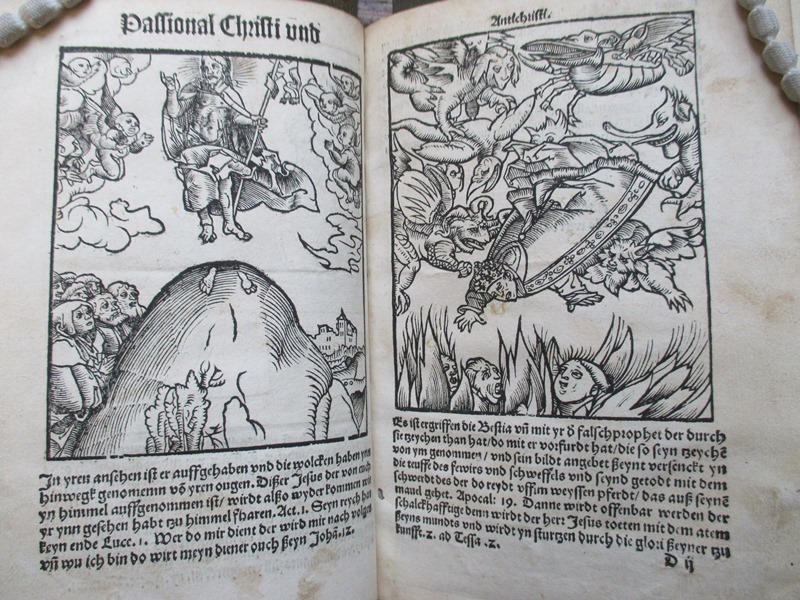 Editions of Caro’s De le lettere familiari del Commendatore Annibal Caro (SAYCE.4) (1591) are in both collections. 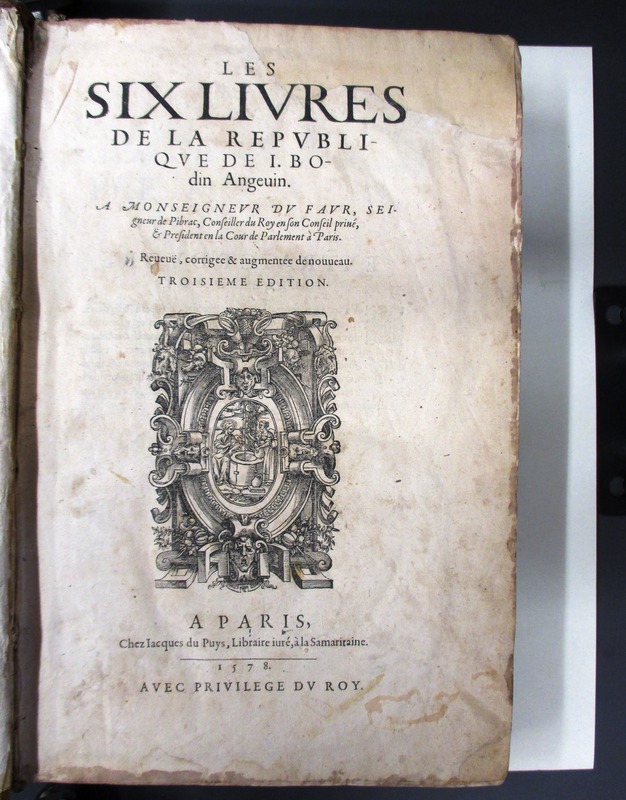 The historian Jean Bodin is represented in Montaigne’s library by J. Bodini methodus ad facilem historiarum cognitionem while in Sayce’s collection there is a translation Les livres de la république de I. Bodin (1578 (3rd ed.) (SAYCE.3(OS)). 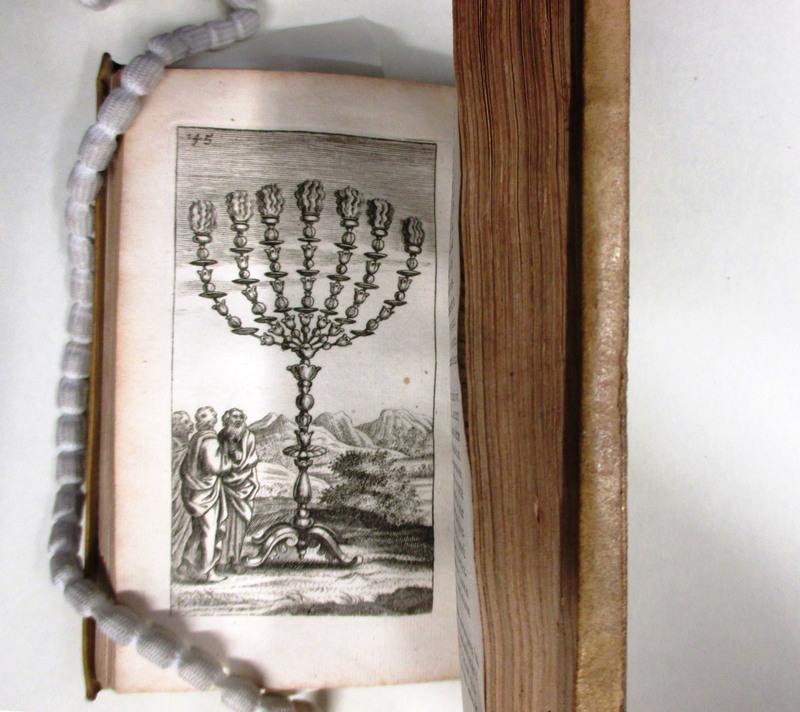 The History of the Jews by Josephus Flaviuswas present in Montaigne’s library and a later edition (1676) is in the Sayce Collection (SAYCE.64-69b) . However, to see a library which actually contains 10 volumes from Montaigne’s original personal library and many more books which would have been likely to have been in his library you will need to go to Cambridge to the Montaigne Library assembled by the scholar and financier Gilbert de Botton. 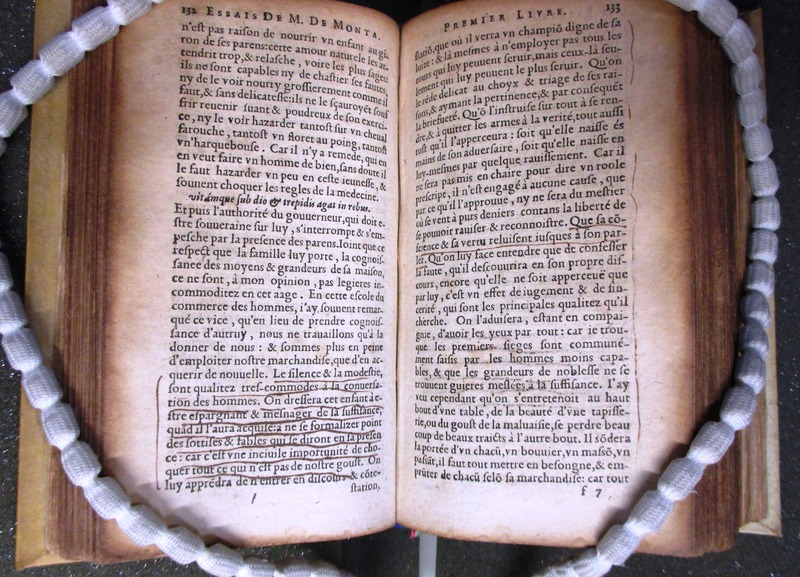 Recreating Montaigne’s library was not the main aim of the Sayce collection which aims above all at placing Montaigne in context as well as following up Sayce’s own interests. 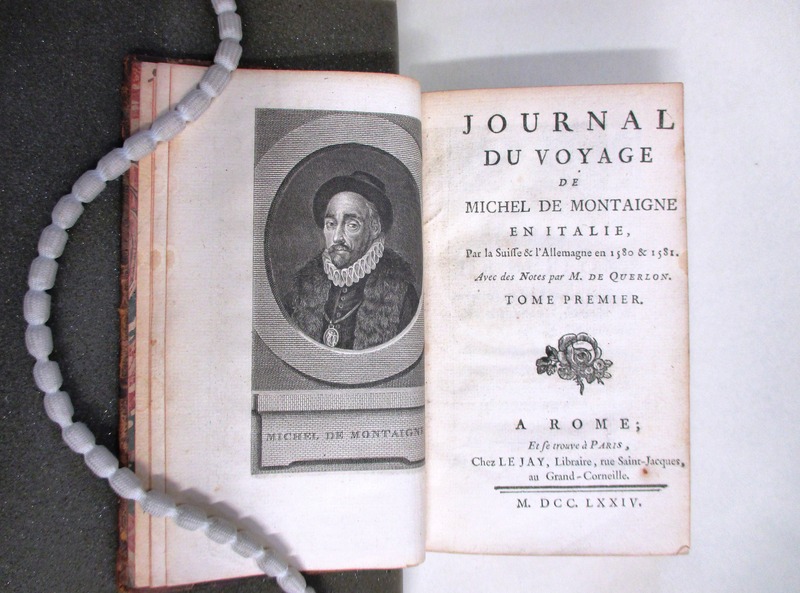 One of the travel books in the collection (and travel books are a feature of the Sayce collection) is the one describing a journey which Montaigne undertook to Italy: Journal du voyage de Michel de Montaigne en Italie : par la Suisse & l’Allemagne en 1580 & 1581. 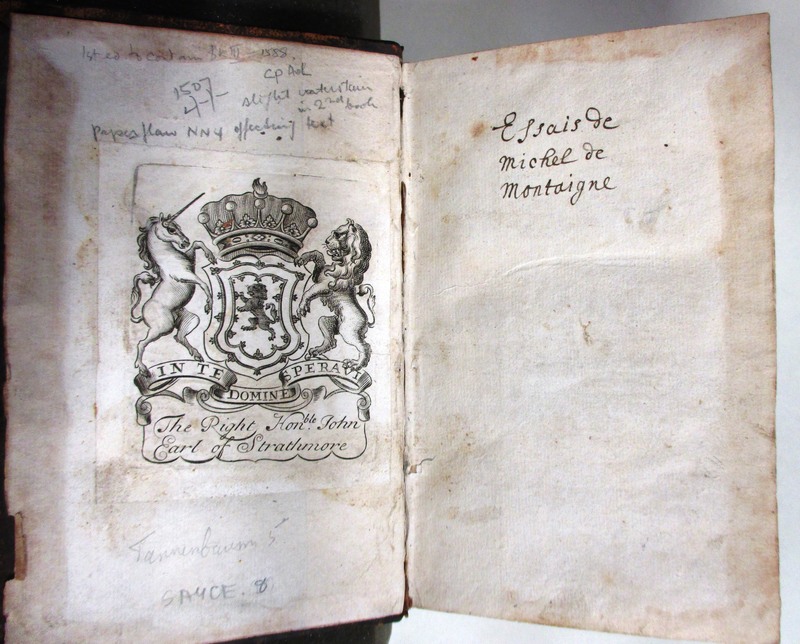 The manuscript of this travel journal was only discovered in 1770 in the Château de Montaigne 178 years after his death. The main purpose of the journey was for Montaigne to cure the pain of his kidney stone at thermal resorts. One of Richard Sayce’s final projects had been to undertake Montaigne’s journey afresh (in a car rather than a carriage), visiting all the places which Montaigne had visited. The photographs that he took of this recreated journey are in the Worcester College archive. Sayce’s two 1774 editions of this work in the collection must be among the earliest editions of the jorunal. The items in the collection closely related to Montaigne include his translation of Theologia Naturalis by Raymond of Sabunde (1385-1436). 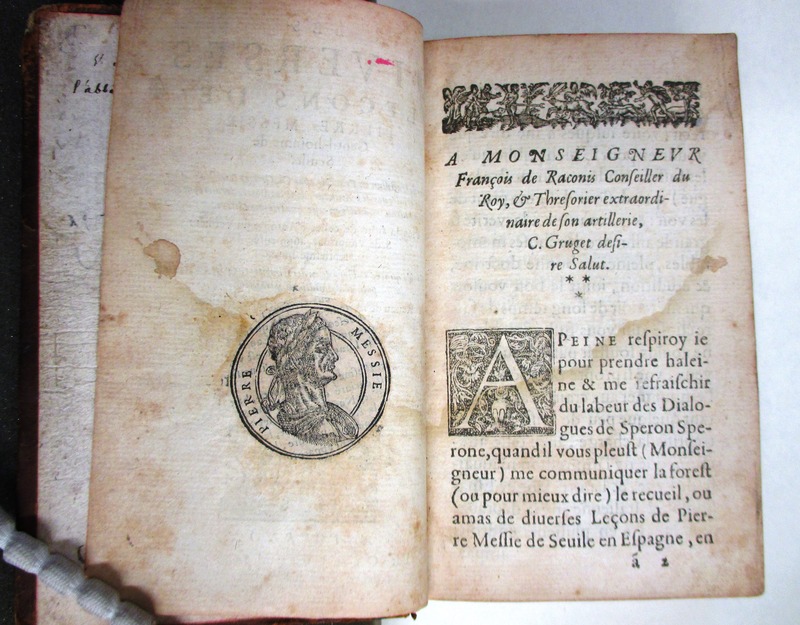 We have two editions of Montaigne’s translation: (1611) (SAYCE.120) and (1640) (SAYCE.121). Montaigne’s father asked Montaigne to translate this work and the first edition of the translation was published in 1568, one year after his father’s death. One of Montaigne’s essays is entitled ‘Apologie de Raymond Sebond’. The work argues for the possibility of the revelation of divine truth through nature as well as the Bible. It is above all the natural and the spontaneous which come through in the Essais with their characteristic digressions. 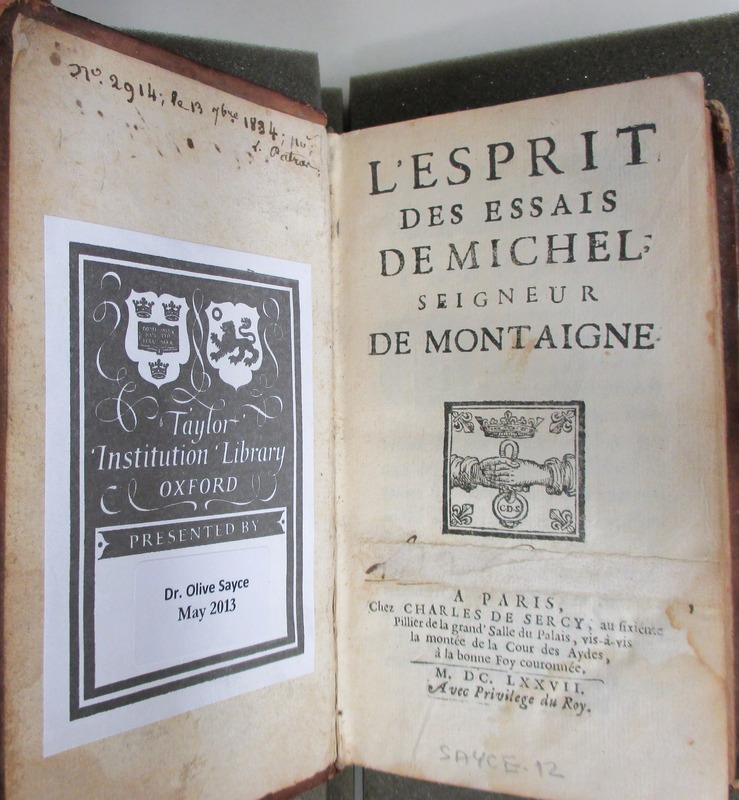 There is a wealth of other books in the Sayce collection – many of them related in one way or another to Montaigne and his times and others of them reflecting Sayce’s own interests but we will leave discussion of them to a later blog. If you feel like commemorating Montaigne’s birthday by reading something by or about Montaigne and/or Richard Sayce, here is a short list to enable you to do so. 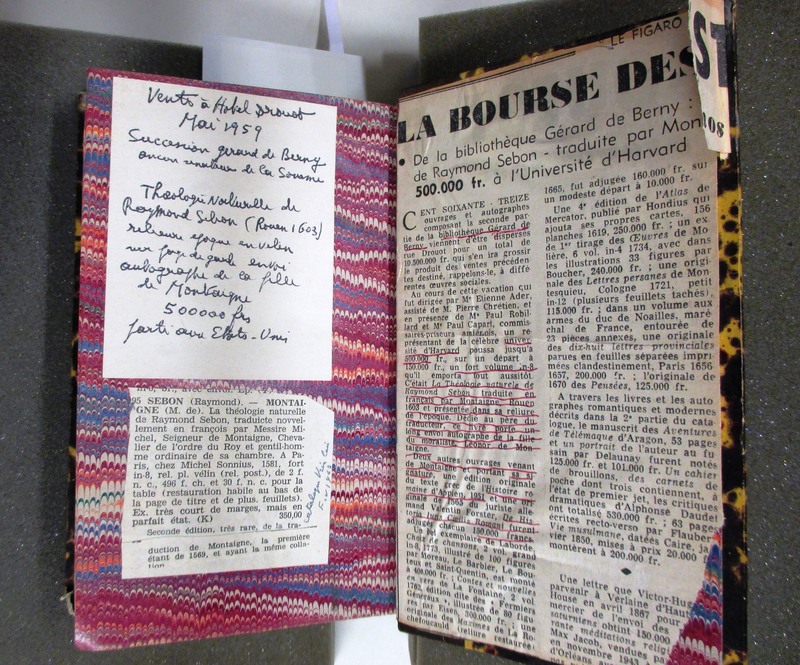 This entry was posted in Special Collections and tagged Michel de Montaigne, Olive Sayce, Richard Sayce on 3 March 2015 by Clare Hills-Nova.